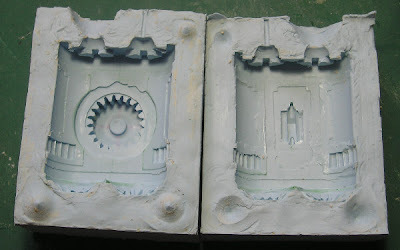 Well, I finished the RTV moulds for all the pieces and again have mixed results. On the plus size they've all cast and set well and there are bo air bubbles in any of the moulds! On the down side there are a few problems. The most significant of which is one i never expected. When I was building the master models I've used plastic sheet to create 'panels' that sit on a number of the surfaces (mimicking the plating on the Old Crow vehicle range). These panels were glued on using plastic cement sparingly in the same way you'd put together a model kit. This glue melts the two plastic surfaces together. The problem is that it hasn't fully sealed the edges of the panel and in a large number of places the RTV rubber has actually flowed between the panle and the underlying surface giving almost all of the panels a ragged'flap' of very thin RTV. The worst effected by this problem is the engine mould. You can see that almost all of the edges have a flap of rubber where it has seaped between the layers of plasticard. Then there is the landing gear where I think the rubber had a job filling the complex detail in the centre and looks incredibly ragged. The simplest of the moulds is the tailplane as it has none of the edges that seem to have caused problems on other moulds. But here the rubber poured on the escond half of the mould has seeped under the master model and adhered to the first rubber pour. You'll see in the circled detail. Probably the cleanest of the moulds is the largest, the cockpit. I need to cut a pouring hole at the rear of the cockpit and some vent holes still. I think the way to fix the problem might be to seal the masters with varnish before I pour the rubber moulds. A gloss varnish might seal the panel edges so that the rubber cannot get underneath? I guess the proof of this will be what the first resin casts look like - and I'll probably pour them this evening, but its all looking a bit disastrous about now. What I would suggest is to pick the best of the bunch and try to cast from that mold. 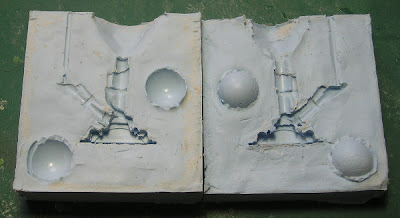 If it doesn't turn out too well, then you haven't wasted too much resin AND if the best one turns out badly, then the worse molds will end up terrible...so it will save you wasting even more resin. 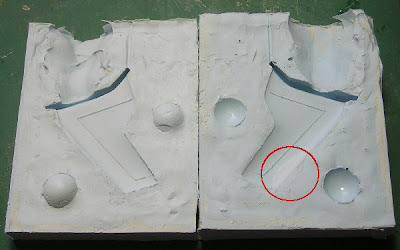 I think that if there is a problem with the rubber getting in the gaps where you don't want it to, then you need to seal it like you said and try some more molds. I'm sorry to say this but it seems like pressing on with flawed molds seems a waste of effort...I think you need to get the molds right first. It's a pain but in the long term it makes sense. ...Deep breath...and go for it! Agreed. Any flaws in the mold will be copied into all the casts you pour in them. Better to take this as a learning experience and try again. A varnish coat may fill in the gaps, but I would use some modelling puttw instead. That way you are sure they are filled in before you pour more rubber. Point one: when making masters for casting, DON'T be sparing with the solvent. Silicone rubber will get through the smallest gap, especially under pressure or vacuum. If you're trying to seal every last hole, thinned PVA will usually do the trick; varnishes and similar spirit-based sealers may react with the curing RTV. 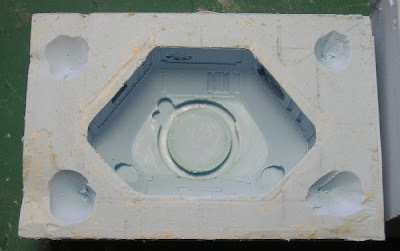 At worst, PVA will flake off and can be scrubbed from your cured mould. Your moulds aren't necessarily a write-off. With luck you'll find that your resin pour will try to replicate the deep undercuts you've effectively created; after three or four casts you'll tear away the unwanted flaps by the act of demoulding. The only way to find out is to try a cast. 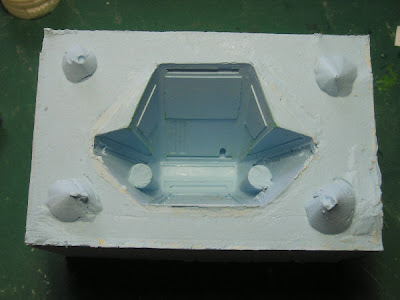 As Inso's said, though - the more work you put into getting the moulds right first, the easier your casting will be.